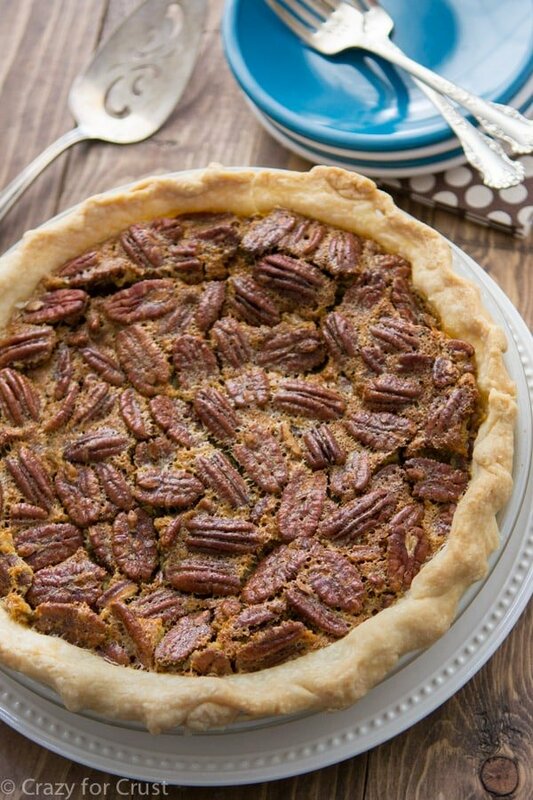 My Mom’s Classic Pecan Pie Recipe is one of our favorite traditional pies. It takes just a few ingredients and a few minutes to make this easy pie recipe! I think whoever coined the phrase “easy as pie” was talking about Pecan Pie. It’s one of the easiest recipes around and now? It’s one of my favorites. I’ve talked before about how pecan pie was not one of my favorites. I’ve talked about how my mom is famous in our family for this pie…but I never wanted to eat it. Now? Now I want to eat it all. The. Time. I’m mad I did not realize how good pecan pie was when I was growing up; I feel like I wasted YEARS of my life not eating this easy and classic pie recipe. It’s kind of depressing in a #firstworldproblem way, dontcha think? Oh, well. I’ll make up for it this year, I’m sure. I declare 2018 the year of the pecan pie. My mom has so many classic recipes, most from her old Home Ec class in high school. I think this is one of those recipes. This recipe is my mom’s famous recipe. My mom is pretty famous on this blog, don’t you know? She’s the one who introduced me to the best banana bread in the world, russian teacakes that I ended up stuffing with Reese’s, and she makes a mean pumpkin pie. 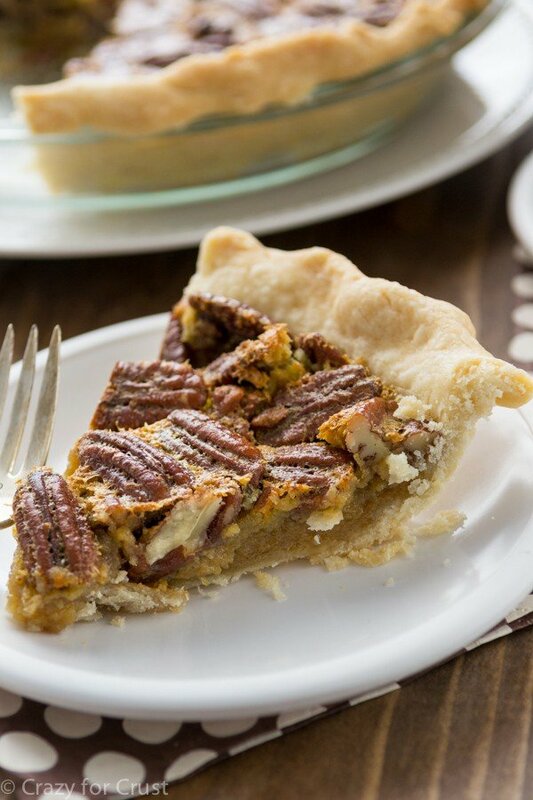 This easy pecan pie recipe is a class and sure to be a hit! I consider this an old fashioned pecan pie because it’s made with Karo. If you don’t like using corn syrup, try my other favorite pecan pie: Elmer’s Brown Sugar Pecan Pie. That one is to die for also! Traditional pecan pie is such a classic recipe. 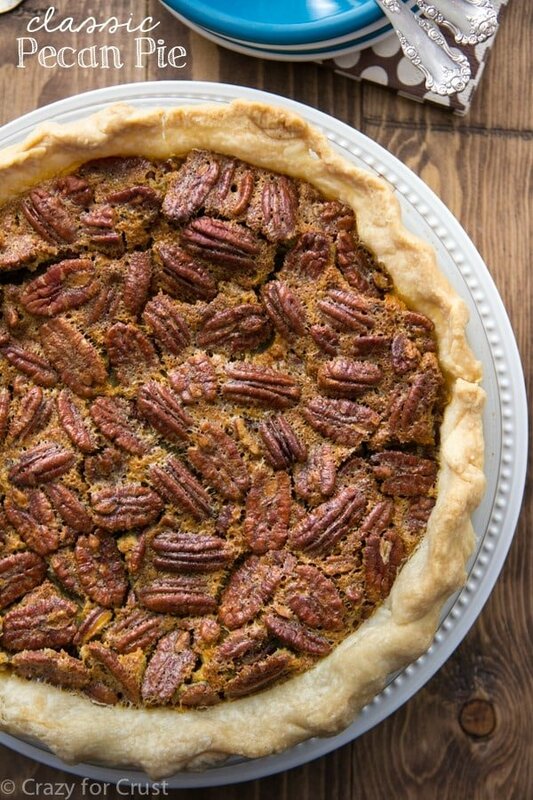 I don’t know about you, but it’s never Thanksgiving without pecan pie! 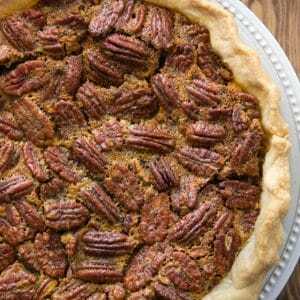 Wonder how to make a simple pecan pie? So, let’s talk about texture for a second. I’m not a huge fan of jelly type textures, and that’s why I never loved pecan pie as a kid. I loved the flavor of it, but not the texture, which is why my secret ingredient makes this pie filling perfect and creamy. Just 2 teaspoons of cornstarch added to the filling made it creamy and not like gelatin. I know you’re going to love this pie. Seriously – it takes about 15 minutes to put this pie together. It’s one of the easiest things you’ll make this holiday. Try it. You won’t be sorry! This Classic Pecan Pie is as easy as they come. A handful of ingredients makes the perfect pie! Preheat oven to 425°F. Line your pie plate with your pie crust, crimp edges as desired, and chill until ready to fill. Note: make sure to use a 8-9” pie plate for this pie; using anything bigger than 9” will result in a not full pie! Whisk eggs, corn syrup, sugar, butter, salt, and cornstarch in a large bowl. 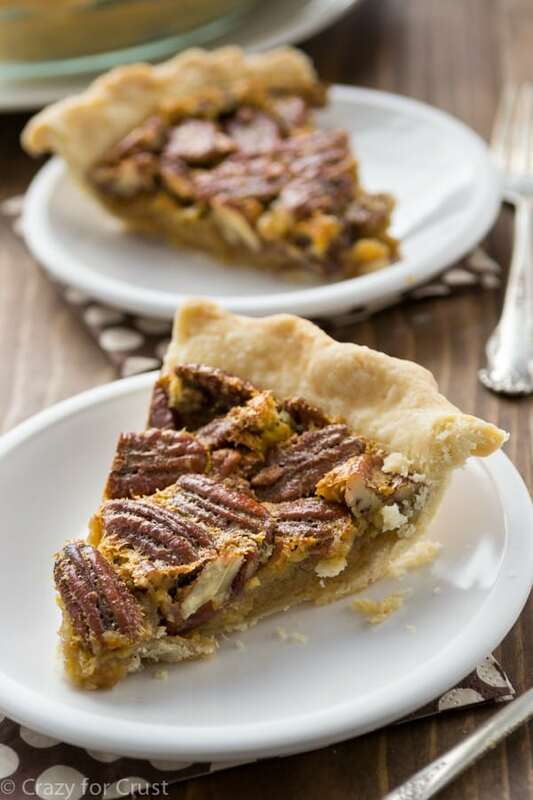 Place the pecans in a single layer in the bottom of your pie crust. Pour the filling over the top. The pecans will rise to the top of the pie. Bake for 10 minutes at 425°F. Then lower the temperature to 350°F and bake for 20 minutes. At that time, carefully remove the foil strips or pie crust shield, then bake for another 12-16 minutes until the pie is puffed and browned. Remove from oven and cool completely before serving. (I chill mine overnight and then bring it to room temperature before serving.) Store covered in the refrigerator for up to 3 days, or freeze (whole or slices) for up to one month. 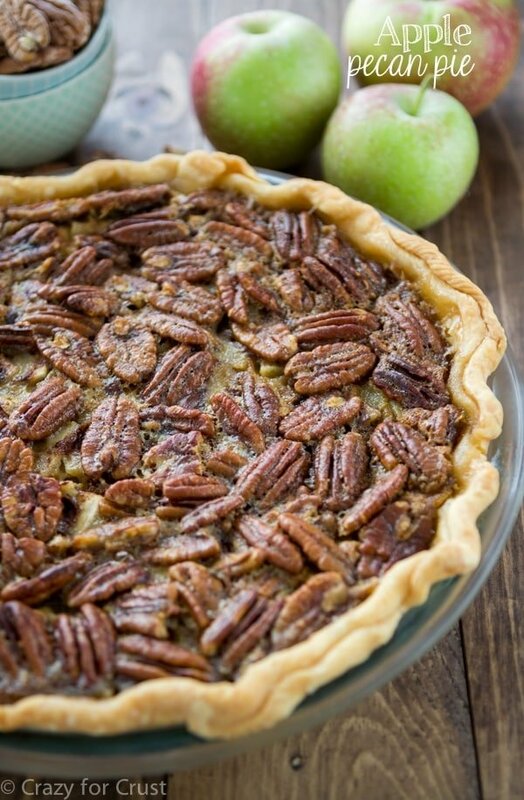 Apple Pecan Pie is another of our favorite pie recipes! 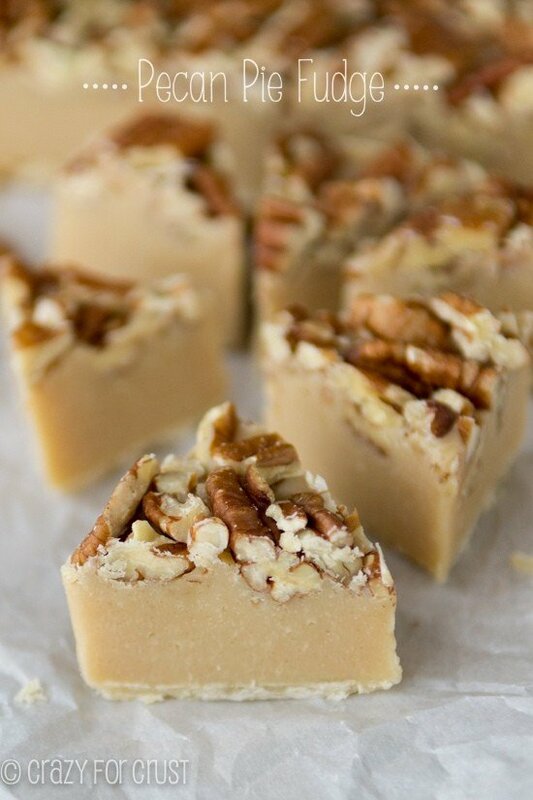 Pecan Pie Fudge combines fudge and pecan pie flavor! 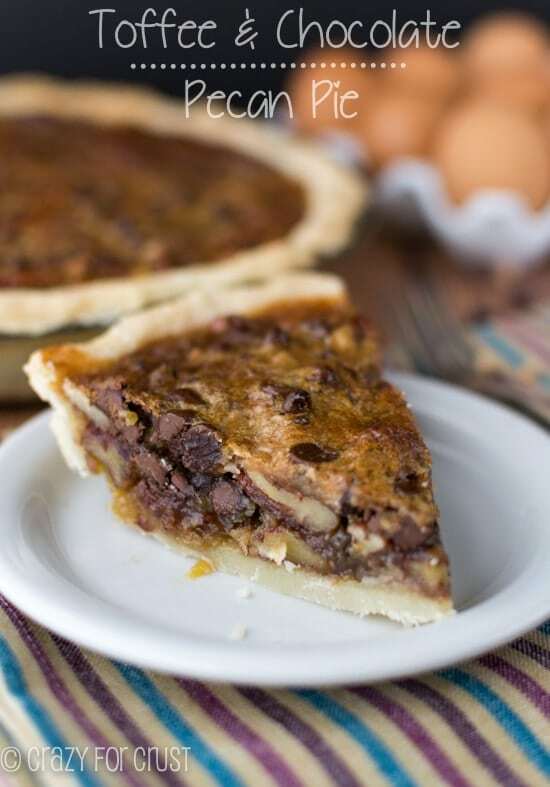 Toffee & Chocolate Pecan Pie is chocolate pecan pie made even better. I also didn’t appreciate pecan pie until a couple years ago and I don’t know what I was thinking!!! WTF?!?!? I wanted a simple recipe and all I get are ads, opinions, stories, etc. Scroll down a couple of pages until the recipe. WHICH I’M BEING TOLD I’M GOING TO ENJOY. JUST GIVE ME A RECIPE, NOT A COSMO article! First time I have ever made a pecan pie. This recipe was easy and pie was great. I think the cornstarch made all the difference based in other recipes I’ve read. Excellent pie, Dorothy. My husband and I just moved to Texas and a neighbor gave us a bag of pecans and was mentioning pecan pie, so I thought why not! Thanks to you it turned out great! Thank you so much for your moms recipe it’s was a big hit for my Family especially For my husband it is super easy and delicious ?